Hero MotoCorp has been a no stranger in introducing new concepts at the biennial Auto Expo. However, the transformation rate from the concept to production stage is largely minimal. Most recently, at the EICMA, Hero showcased four Xpulse 200T based concepts with Café Racer, Desert concept, Scrambler and Flat Track themes. The most promising motorcycles of them all over the years have been the XF3R and HX250R. The concepts were so fascinating that when Hero remained numb about their production existence, the discontent among the enthusiasts was so blatant. The largest two-wheeler brand in the country had already divulged that the new 200 cc platform the Xtreme 200R is based on would spawn new products. With the Xpluse 200 and Xpulse 200T expected to be launched in the due course of this year, the first glimpse of a true entry-level performance motorcycle from Hero appears to have come up on the internet. The short clip emerged on Instagram does reveal that the motorcycle has standard ABS (Anti-lock Braking System) and it belongs to Hero as you can see clearly. 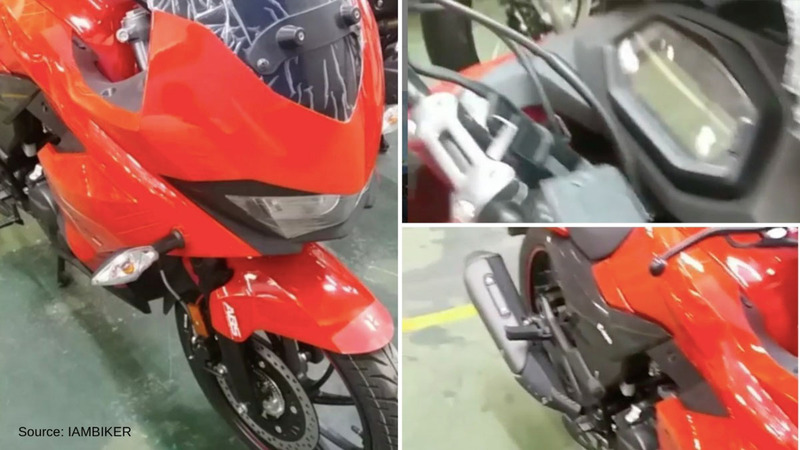 Considering that Hero has been cautious about its premium motorcycle plans and the Karizma is long due a big upgrade, the leaked footage could be the production version of the next generation model. The motorcycle wore a red paint job and it has design heavily influenced by the HX250R concept unveiled at the 2014 Auto Expo. The concept was claimed to have lightweight mass centralised geodesic tubular chassis with engine as a stressed member and best-in-class performance. As in the concept, the production version could have the rider sat deep and the all-digital instrument cluster is a complete departure from the part-analogue part-digital unit found in the Xtreme 200R. Other notable features are black surrounding trim over the twin headlamp setup that could feature LED technology, black multi-spoke alloy wheels, ventilated discs, LED turn indicators grafted on the side fairing, tall windblast protector, single exhaust outlet with heat shield, blackened engine components, side panels and footrest as in the Xtreme 200R, switchgear reminiscing the naked sibling and high set split handlebar. We expect the road-going HX200R to be positioned well above the Xtreme 200R and compete against the likes of Bajaj Pulsar RS200, Yamaha FZ25 and the upcoming Suzuki Gixxer 250 lined up for next month. The powertrain could be a liquid cooled and fuel injected 198 cc single-cylinder unit to produce more than 20 horsepower and it should be mated to a six-speed transmission. 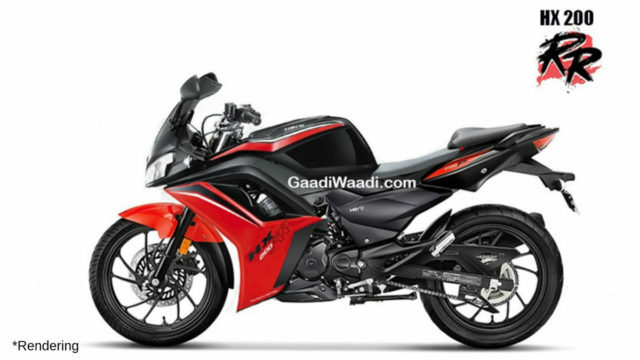 Hero may opt for a bigger 250 cc engine as well but the details are scant at the moment.